Our yachts are limited to six passengers and some of our friends have wanted more on hand and have asked me, Chaplain Dan, to preside at ceremonies ashore. 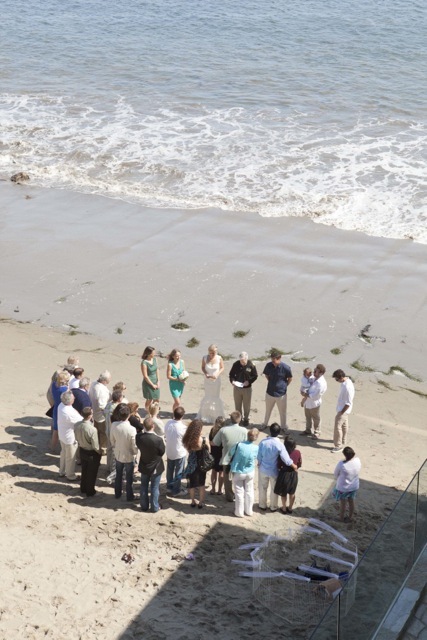 I’m fond of beaches, but have done ceremonies in homes, country clubs and a fairly wide assortment of non-church venues in Ventura, Oxnard, Santa Barbara, Malibu and Los Angeles. BTW – the wedding pictured here had unexpected visitors when two migrating gray whales surfaced 50 yards from the beach just as we were about to begin the ceremony. I’ve always viewed dolphins accompanying us as good omens. Whales must be that much bigger and better. No guarantees that your ceremony will have natural or supernatural support.